We don't think that anyone will deny that, at the end of the tournament, the blinds and limits were huge. It made the tournament anyone's game to win. Adam Peck took advantage of a rush of cards at the right time to take down the championship, the first place prize, and the winner's ring. That concludes our coverage of Event #13, Mixed Hold'em. There's still plenty of poker to be played at the Crown Poker Room over the next few days, including the thrilling Day 4 and Day 5 conclusion of the AU$10,5000 Main Event. Tune in to PokerNews for all the action. 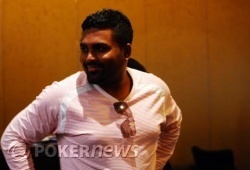 Marlon Goonawardana Eliminated in 2nd Place (AU$18,430); Adam Peck Wins Event #13! There's no cap in the limit hold'em round when action is heads up. Marlon Goonawardana and Adam Peck took advantage of that. Peck raised first to 32,000; Goonawardana made it 48,000; Peck went to 64,000; Goonawardana to 80,000; and Peck to 96,000. All preflop. Goonawardana seemed to suddenly realize that he was in trouble. He asked the dealer to confirm how much he was already in for, then just agreed with Peck to get the rest in preflop. "I'm already committed," he said. Peck paired his king on the flop, , taking almost all of the drama out of the hand. The turn and river fell and to send Goonawardana to the rail. He collect AU$18,430 for his second place finish. 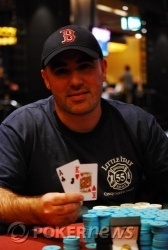 We had barely made it back to the table after the elimination of Taner Durst when another big pot was brewing. The board showed . 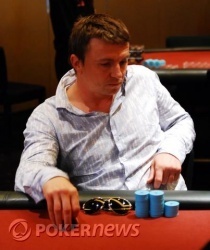 Sergey Ershou bet 20,000, then called after Adam Peck moved all in. It took Ershou about five seconds to realize that his small straight was second-best to Peck's bigger straight. He summed up the realization with one quiet word. The river blanked . When the stacks were counted down, Peck had Ershou covered. "Sh*t. I made mistake," said Ershou. He was whisked away to the cage to collect his AU$12,900 prize money. The two remaining players then requested a short bathroom break. Sergey Ershou opened for 18,000. Action passed to Taner Durst, who moved his stack of about 45,000 into the middle. Ershou called with the red kings; Durst had a live ace, . He could only come up with a pair of queens on a board that came out . As a result he's off to the cage to collect AU$8,600. 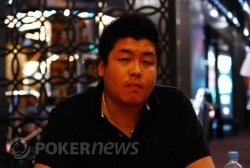 Limit hold'em crippled Trung Tran; no-limit hold'em eliminated him. Tran went to war with Adam Peck on the last hand of limit hold'em, raising preflop and then calling Peck's three-bet from the small blind. Peck made the first bet on a board of . Tran then raised enough to put Peck all in. He called. The turn and river were blanks. That left Tran with only 8,500 chips. He was in the 6,000-chip big blind on the next hand, when the game switched to no-limit hold'em. 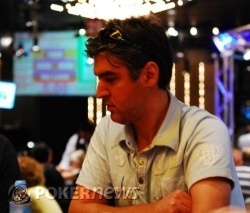 He moved in preflop after Marlon Goonawardana and Taner Durst both limped in. The action was checked all the way down on a board of . Goonawardana came up with a pair of sevens, . That was enough when Tran turned up . The game is limit hold'em now, and blinds are a staggering 6,000 and 12,000. On back-to-back hands, Sergey Ershou has doubled up the two shortest stacks on the table when they were in the big blind. Each time he raised, and they called all in. One time he tabled the worse hand, against Adam Peck's , the other time the best hand, against Taner Durst's . It didn't matter; Ershou lost both hands. All three players are now rougly equal in chips. A short stacked Andrew Kanaridis has been eliminated after he moved all in with and found a call from Trung Tran with . 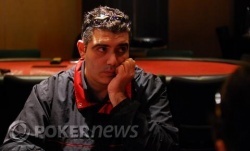 The flop put Kanaridis behind, and he couldn't regain the lead after the turn and river.